Burnley striker Ashley Barnes hailed a massive Premier League win for the Clarets at Brighton & Hove Albion on Saturday. Barnes set up Chris Wood for the opener and later scored the third from the penalty spot in Burnley's 3-1 win, which lifted them out of the relegation zone. The victory moved the Clarets level on points with Brighton, who are yet to win in the Premier League in 2019. Both sides are just three points above the drop zone and Barnes said: "It's a massive win. We said before the game that Cardiff had won so we knew it was going to be a massive game and we needed to win. "We knew we had to win otherwise we'd have been in the bottom three." Burnley keeper Tom Heaton made three excellent saves before the Clarets went ahead and Barnes said: "Heats kept us in the game with some fantastic saves and he was phenomenal. "But you could single out all the lads, they were amazing." 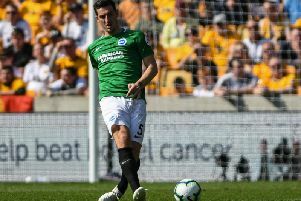 Barnes scored more than 50 goals in four years with the Seagulls and netted for the first time against Albion on Saturday. He said: "It's always nice to score. I had some amazing years here but I had to do my job and we did that."